Liczba stron: 328 Jest to ujednolicona liczba stron, która ułatwi Ci porównanie długości książek. Każda strona Legimi to 200 słów. 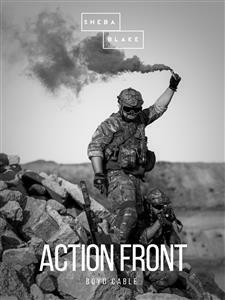 Action Front is a story about action on the front lines in war torn Europe. In the midst of World War I, writer Boyd Cable carved out a niche for himself by collecting factual nuggets from the front lines of the conflict and using them as the foundation for gritty, action-packed short stories. Cable does a masterful job of including authentic dispatches into his fictional accounts. In the forward Cable expresses his concern that many may find this book to grim and too graphic. The volume Action Front collects some of Cable's best efforts. Readers looking for blow-by-blow battlefield accounts won't be disappointed. He also says that this is necessary to portray the accuracy of the action on the front lines. Cable does manage to include incidents on the lighter side. Copyright © 2018 by Boyd Cable. "He say," interpreted the other, "Why you English war have made?" Macalister stared at him. "I'm no English," he returned composedly. "I'm a Scot." "If you'll just listen to me a minute," said Macalister deliberately, "I can prove I am right. Sir Edward Grey----" Bursts of exclamation greeted the name, and Macalister grinned slightly. The German went on to impart a great deal of astonishing information--of the German advance on Petrograd, the invasion of Egypt, the extermination of the Balkan Expedition, the complete blockade of England, the decimation of the British fleet by submarines. When at last their interest flagged, the Germans ordered him to move on. Macalister asked where he was going and what was to be done with him, and received the scant comfort that he was being sent along to an officer who would send him back as a prisoner, if he did not have him killed--as German prisoners were killed by the English. Macalister looked at him and said "Sir"--no more and no less. "Yes--sir; we say 'sir' to any officer and any gentleman." "And now," said the officer, "we shall continue our little conversation; but first you shall beg my pardon for that hint about a gentleman. Do you hear me--beg," he snarled, as Macalister made no reply. "If I've said anything you're no likin' and that I'm sorry for masel', I apologize," he said. Then the officer spoke. "One minute," he said, "and then I fire." He lifted his pistol and pointed it straight at Macalister's face. "I am not bandaging your eyes," went on the officer, "because I want you to look into this little round, round hole, and wait to see the fire spout out of it at you. Your minute is almost up ... you can watch my finger pressing on the trigger." "Do not cheat yourself," he said. "You cannot escape. If a charge comes I shall shoot you first." With a sinking heart Macalister saw that his last slender hope was gone. He could only pray that for the moment no attack was to be launched; but then, just when it seemed that the tide of hope was at its lowest ebb, the fates flung him another chance--a chance that for the moment looked like no chance; looked, indeed, like a certainty of sudden death. A soft, whistling hiss sounded in the air above them, a note different from the shrill whine and buzz of bullets, the harsh rush and shriek of the shells. The next instant a dark object fell with a swoosh and thump in the bottom of the trench, rolled a little and lay still, spitting a jet of fizzing sparks and wreathing smoke. "Now," said Macalister, "you'll quick mairch--that way." He waved the pistol towards the British trench. "You'll mak' an offer!" said Macalister contemptuously. "Here"--and he waved the pistol across the open again. "Get along there." "I will give you--" the officer began, when Macalister broke in abruptly. "Ye would, would ye?" growled the Scot, and seized his captive by the shoulders and shook him till his teeth rattled. "Now," he said angrily, "ye'll come wi' me or--" he broke off to fling a gigantic arm about the officer's neck--"or I'll pull the heid aff ye." "I will not," said the German furiously, and turned again to the subaltern. "I tell you I surrender----"
"This is the man," he said, nodding his head towards the officer, "and I wad just like to tell you carefully and exactly what happened between him an' me. Ye'll understaun' better if a' show ye as weel as tell ye. Weel, now, he made twa men tie ma' hands behind ma' back first--if ony o' ye will lend me a first field dressing I'll show ye how they did it." "That is sufficient of this fooling," said the officer, with an attempt at bravado. "It's your turn, I'll admit; but I will pay you well--"
Macalister interrupted him-"Ye'll maybe think it's a bit mair than fooling ere I'm done wi' ye," he said. "But speakin' o' pay... and thank ye for reminding me. Ower there they riped ma pooches, an' took a'thing I had." "To go on wi' this begging pardon business," he said, "If a couple o' ye will just stand ower him wi' your fixed bayonets.... Thank ye. I wouldna' kneel," he continued, "so one o' them put his weight on my shoulders----" He looked at one of the guards, who, entering promptly into the spirit of the play, put his massive weight on the German's shoulders, and looked to Macalister for further instructions. "He kept me," he said, "on my knees, so I think he ought ... thank ye," as the German went down again none too gently. "After that he went on saying some things it would be waste o' time to repeat. Swine dog was about the prettiest name he had any use for. But there was another thing he did; ye'll see some muck on my face and on my jacket. It came there like this; he took hold o' me by the hair--this way." And Macalister proceeded to demonstrate as he explained. "Then--my hands being tied behind my back you will remember, like this--it was easy enough for him to pull me over on my face--like this... and rub my face in the mud.... The bottom o' this trench is in no such a state a' filth as theirs, but it'll just have to do." He hoisted the German back to his knees. "Then I think it was after that the pistol and the killing bit came in." And Macalister put his hand to his pocket and drew out the officer's pistol which he had thrust there. "To make it right and fair," said Macalister, "his hands should be loose, because I had managed to loose mine. Will one o' ye ... thank ye. It's no easy," continued Macalister, "to just fit the rest o' the program in, seeing that it was here a bomb fell in the trench, an' his men bein' weel occupied gettin' oot o' its way, I threw him ower the parapet and dragged him across to oor lines. Maybe ye'd like to try and throw me out the same way." "Right," said the subaltern. "You can take him with you when you go. They've got some more prisoners up the line, and you can join them."